Day 2 Mon 20th July. 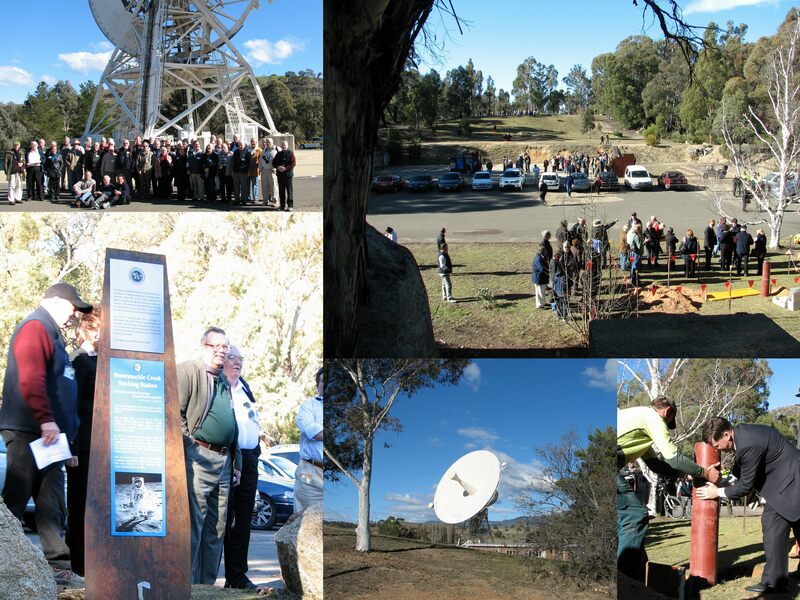 "Morning and light lunch at CDSCC (Canberra Deep Space Communications Complex). Due to the generosity of the CSIRO Director and the staff, the whole day including the coaches will be FREE. See http://www.cdscc.nasa.gov/ The visitor centre pages have a 'How to get here' section. This event commencing at 10.30am will commemorate the historic first steps on the Moon in July 1969. This will also be a time to ceremonially farewell the 26-metre antenna Deep Space Station 46 (HSK’s original DSS44 antenna) which will end its space tracking life in August 2009. A plaque will be unveiled in its honour. After lunch it is hoped that the coaches can be used for a tour around the complex grounds and Antennae. Then we will all decamp to the South via Thawa for the 30-40 minute trip to the Honeysuckle site. Will run from 2 to 3pm approx. The events will include unveiling a Plaque dedicated to the workers at the site by Senator Annette Hurley representing Senator the Hon Kim Carr Minister for Innovation, Industry, Science and research. We will also bury a 100KG Time Capsule - The capsule will be sealed and officially dedicated by Brendan Smyth MLA Deputy leader of the Opposition in the ACT Legislative Assembly. Brendan has always been a strong supporter of Hon If you have some small Apollo era memorabilia you would like to be in the capsule - please bring to Tidbinbilla! There will be many ex-HSK staff in attendance to answer questions and point out areas of interest. Two 52 seater Coaches will leave from Bay 18 Woden bus interchange at 9:30am and will return there at around 4:30pm. At time of this update (15th July) there are spare seats available. SO be sure to travel in comfort and style (with someone else driving :-) if you would enjoy that".